A city-state has developed in the middle of a (magical) desert which is subjected to a constant wind and always regenerating its sand. This wind is gale force, always blows in a straight line from east to west, and is of a constant, unfluctuating speed - how do you prevent erosion or burial by blown sand? The other solution I've considered is streamlined buildings which curve in the direction of the wind flow, though I assume this would put limitations on how tall buildings could be, which is inconvenient to preventing getting buried. The city is built with modern day materials and has a decent economy, so what would be the most economically and logistically sound way to defend against desert reclamation? This seems very similar to the Stormlight Archives series. There is a large storm that always comes from one direction. Because of this, all towns across the entire world are built to withstand a very strong force coming from that direction. If you have a quick second, I'd read through the link below. Might be an interesting read, as it sounds kind of like what you're imagining in a way. Caravans that are forced to weather a highstorm in the open chain their wagons to nearby boulders and use them for protection. Settlements have more permanent solutions. The city of Kholinar is built inside a large stone formation known as the windblades, while the town of Hearthstone uses the breakwall for protection. A Wedge shaped wall, with the point facing the wind would both mitigate the difficulties, and provide a near limitless energy source with vents along the walls which could be opened and closed to harness the wind power. Expansion to the system/city would be as simple as extending the walls Don't streamline the individual buildings, streamline the wall. additional structures outside the wall could be built to capture/channel the wind for whatever purposes you need. 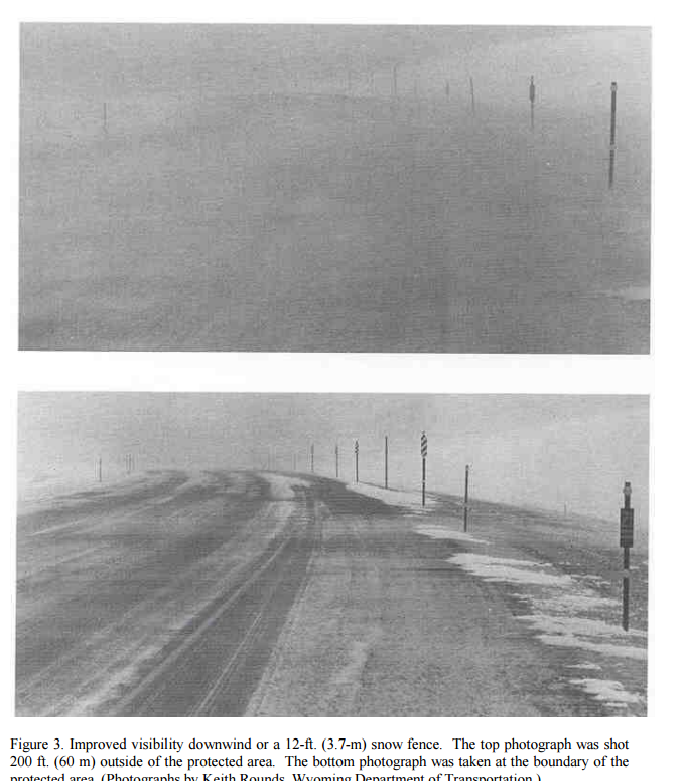 To control the force of the wind, flow can be controlled by going from a wide to a narrow to a wide channel, various "catches" can be set up to catch the sand. with stone jutting out to slow the sand and catch basins below it. Antarctic bases have largely solved the snow drifting against buildings problem by raising the buildings on stilts so that the snow blows clear underneath them. You could use the same strategy with sand. It would be advantageous to shape the buildings to enhance the wind under them helping to blow the sand clear. This could lead to some interesting building shapes in your world. Edit-Erosion control. If you have ever been on a beach In a high wind you will appreciate that it is the bottom of your legs that are stinging and that is where the highest erosion is taking place. Simply because sand is heavy and it takes more energy to lift it higher. Perhaps the bottoms of the legs could be covered in a hardened metal or dragon scales. By minimizing the area exposed to the highest erosion you minimize the amount of maintenance. You could also create a biodome large enough for a city. On the west side, you can have your entrance and exit doors for your dragons and people to come in and out of. This will allow you to keep the east side structurally sound as you don't have to worry about weak points with entrances/bad sealing. Being that it is a dome, you can insure that no wall of sand will take over the city (Winds of this force will create daily haboobs. Trust me not fun being someone who has lived in the middle east and currently lives in Arizona). This will allow for the city to stay dust free and sealed in. You will also have to consider the shape of the path the air will take. If you provide a path for the air to travel back down the other side (an airplane wing for example) you will create constant downward wind on the far side. This is great if you are trying to use the wind to help propel something forward but not so much when people will be coming in and out through the entrance. This means that the top will need to be flat with a slight curve up to push the wind out and away from the farside. So essentially if you are still following along, the east side of the dome will start with a point to initially break the wind that works up to a wider segment where the inhabitants will live. The dome continues at a steady incline from the point like an equal-lateral triangle with the point facing into the wind. From there you have your livable area where this triangle reaches it's max height (inside the triangle will feed off of @Richard U's idea of harnessing the wind by creating a powerplant to help maintain aerodynamics and energy). The main body will then be like a cylinder with pointed sides (rounded falls into the issue I described above) with the flat end on top and bottom and the pointed north and south ends to help keep the wind away from the west side. On the top of the cylinder on the west side, you can add in a slight incline to push the wind up and away from the west wall. There should be enough wind diversion that the west side of the dome doesn't particularly matter on the shape as the top, north, south, and east points are all diverting the wind up and out. To keep the city from being burried you can create a storm drain of sorts like we have with water, that the sand will roll off of the dome and into the drains that will then take the sand and run it through a processing system that will allow for the sand to be used within the city. Glass is one of the biggest uses for sand along with construction in terms of cement/fiberglass and so on. The excess sand can be easily dumped off into the west side side outside where the wind will take the excess sand and blow it AWAY from the dome keeping the dome clean. The other great thing about biodomes is that you can regulate the air temperature. You said this is a desert so it would be really hot. A dome will allow you to control temperature and could even have a system that allows you to open or close shading in the dome to block out the sun on extremely hot days. I don't have an illustration, but R Buckmaster Fuller was heavily into environmental buildings, and once published an idea where buildings (especially skyscrapers) would have wing like outer surfaces that were mounted on bearings, and this able to "turn into" the wind for streamlining and reduction of wind forces on the building. You need space around each building for the airfoil surface to turn. While the bottom few floors might not have the streamlining structure, there still needs to be enough room around the upper floors to ensure the airfoil does not turn into another structure nearby. There will also be a large tip vortex being shed from the ends of the airfoil structure, which will affect buildings downwind (especially taller buildings). A tip vortex being shed at street level will make walking or driving very difficult as well. So individual buildings would have issues with shedding vortexes and turbulence (even if, and especially if they are not aerodynamic in the first place). Go underground. Living in tunnels may not be very exciting, but at least you are out of the wind. You need to have protected entryways to break the wind, but once you get down into the foyer, then you are free of the wind. Tunnels are infinitely extendable as well. Build one singular building. This is essentially an Arcology So long as the outside is sealed from the wind, and the entryways are sheltered from the wind, then you can live in the same conditions as you would in a tunnel. The primary issue is building in the first place, and doing repairs and renovations, but building temporary covers over the affected areas is possible. Building a dome over the city. While there is going to be difficulty during the building or inflation stage, once the dome is erected it provides a smooth aerodynamic surface to deflect the wind. Blowing snow particles resemble tiny grains of sand. Snow particles that are too heavy to be suspended in the air move by bouncing or intermittently jumping (saltating) along the surface. If they are too heavy to saltate, particles roll or creep along the surface, forming "snow waves," or "dunes." 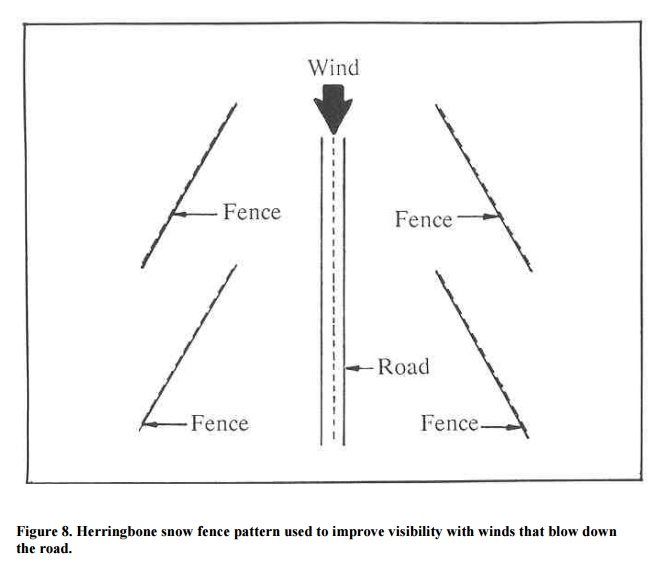 Snow fences restrain the wind, reducing wind speed. This reduces the force of the wind on the surface of the snow, allowing the creeping and saltating particles to come to rest. Some of these particles are deposited on the upwind side of the fence because of the reduced wind speed that occurs ahead of the barrier. Most of the snow deposit occurs on the downwind side of the porous snow fence. 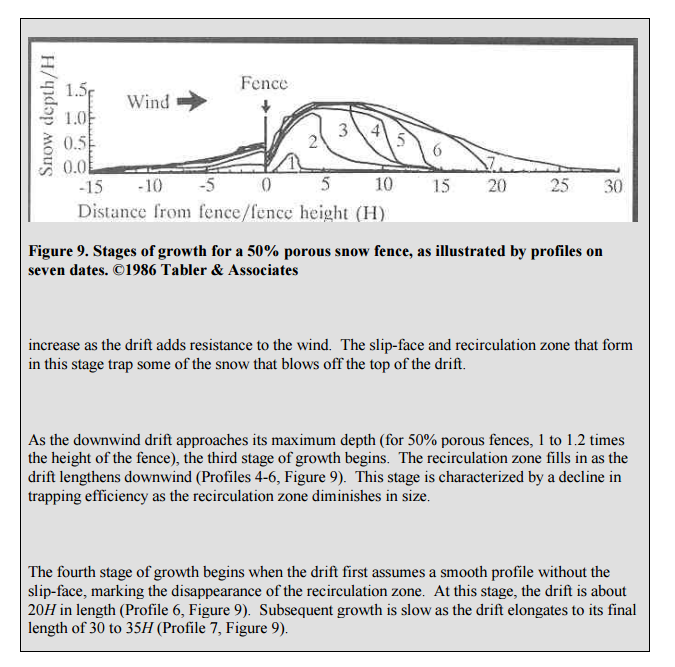 Further information on how drifts form is given on p. 23, "The Four Stages of Drift Growth." Note that a 50% porous fence is mentioned. As I understand it, a solid wall would actually be less effective. 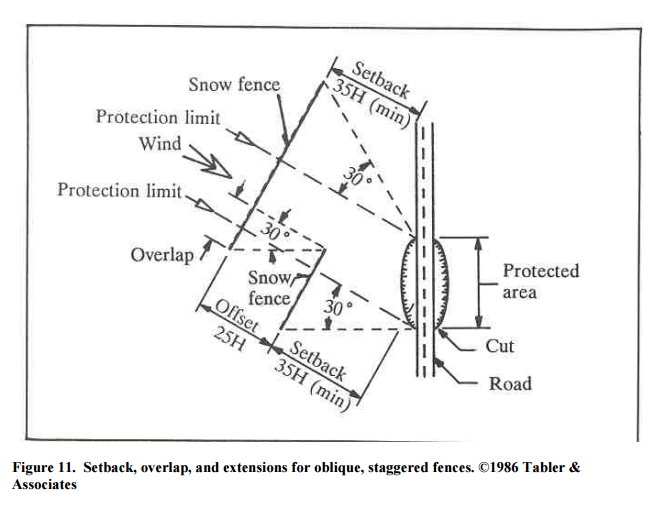 There is also information about setback, overlap, and extensions for oblique, staggered fences. Adding 6 in. (15 cm) to a 4-ft. (1.2-m) fence increases its capacity by 30%. A gap between the bottom of the fence and the ground increases the height and capacity of a snow fence. 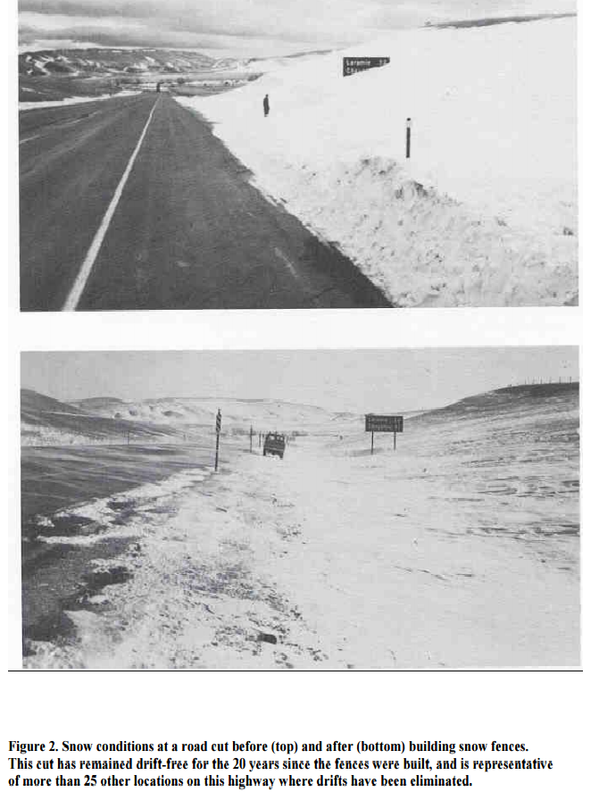 Partially or totally buried fences do not trap blowing snow effectively, are often damaged by snow settlement, and can develop abnormally long drifts. A bottom gap reduces snow deposition close to the fence. Again, a fence would be more effective that a solid wall. I doubt a solid wall would be able to have a gap at the bottom, whereas that is rather easy with a fence. And much more than can be repeated here. Note that I found the above reference among many more in the References section of the Wikipedia article on Snow Fences (which also links to the much less complete Sand Fence article with some additional references). The "wall" could be a long tall building making the construction efforts serve multiple purposes. Look for local geography to help, find a series of hills and put your wall on top of them to increase height and strengthen the natural windbreaks. If made from local materials you would want to quarry material from behind the wall either enlarging an existing valley or making an entirely artificial one for your city. Redundancy is good here, a series of smaller walls ahead of your main city wall if properly spaced could aid in deflecting winds, and provide a suburb or otherwise section off the city. First off if you have a "constant" gale force wind blowing in the same direction then I wouldn't expect a lot of dust, it would have blown away a long time ago, either leaving bed rock or forming fairly stable dunes. In terms of dust removal, you have a constant wind force being supplied to blow that dust away, a properly engineered and shaped wall would direct the wind to blow the dust to the sides away from the city with little accumulation on the wall. This would cause a series of dunes to develop on either side of the city. Or just let the dust pile up, you would end up with an artificial hill, which would still provide a wind break, the only downside would be the dust blowing over the top dropping into your city which would be annoying at times but not a deal breaker for a settlement. Your city is likely to need water so why not dig a canal into your desert to provide it. The canal could provide water to support a large forest style windbreak. Using trees and forests as windbreaks is the most common historical windbreak method. A constant gale force wind would require a lot of effort to support growing a new forest (likely many small windbreaks to protect the seedlings, but once grown it would likely be self sustaining requiring little maintenance. A series of low walls with cleared channels between them and a low rise city. You don't need to worry about streamlining the walls, it's perhaps better not to. Build up of sand on the outside of the wall will protect all but the top edge from erosion. Repairing the top edge will be part of your standard city maintenance process. The wind will accelerate over the top of the wall and pick up additional particles, this isn't ideal, but the sudden pressure drop and resultant drop in wind speed behind each wall will cause it to dump a percentage of its particle load. The higher the wall the greater the pressure drop, the greater the percentage of particles dropped from the wind. This will reduce the erosion on your city. What you're doing is creating a sand dune in a fixed location to shelter your city behind. You must keep clearing the channels between and behind the wall though or the ultimate demise of your city under your own ever growing artificial dune will become inevitable. You should also build your structures in such a way that when the sand builds up too much around the base of the buildings you can just tag an extra story on the top and abandon the lost levels to the sand. Use tents or other temporary structures, rebuild on top of the encroaching sand on a regular basis. Don't pretend you can hold back the march of the desert, it will always win. Build your city somewhere else, preferably somewhere with fresh water. Use magic Walls of Force, which are not subject to erosion or wind strength. This could come from animals of some kind (probably a prey-type) which developed the ability as protection in the desert from the wind and sand, possibly even predators. There may also be minerals which when processed produce a force field of some kind(plane, sphere, some other shape). These could be used as building blocks in a wall, or at least as surface facing to reduce or eliminate wear and tear. Use magic Walls of Stone, which would need occasional patching. A creature that could create it's own burrows would have a large survival advantage in a desert, or constant wind environment such as described. It would likely also have an ability to soften or destroy stone. Again, most likely to be a prey-type animal. A magical mineral, which when treated in some fashion, fed energy, heat, etc... expands and grows could also be used. Use magic Walls of Fire, which would melt the incoming sand and heap up a huge glass structure that constantly rebuilds itself. Any creature which consistently produces fire could pull this off - a dragon or some creature which burrows through rock using heat to melt things. (most likely to be a predator, but prey is also a possibility.) melt enough sand to glass and you can eventually build up walls to protect the city. Again, should there be a magical mineral which produces enough heat to melt sand, then it could be used in furnaces to mass produce the glass needed to keep up the walls. Use magic Walls of Water, which would mix with the sand, create mud, and get baked dry. So long as the walls are magically replenished, you also have a water supply - likely to be important. Also self-rebuilding. It is unlikely to find a creature in the desert which could produce enough water to maintain a wall, but producing water would be a definite survival advantage in general. Also, should enough of these creatures be domesticated or harvested, then using mud as building bricks is certainly a possibility. Dig your city down deep, and use magic portals or a periscope-like extensible tower which can break through the current surface of the sand for those times you need to get in or out. Digging down deep could be accomplished by tech or creatures - portals however are usually the result of some kind of tech... unless you have something like link-stone. This unusual mineral has properties such that when you have a large enough chunk, and when split in half, each half remains connected to the other half, resulting in a portal-like opening that is connected to each other on the two halves. Flying city which tacks back and forth across the wind to maintain roughly the same positional region. This is doable with tech and any handy animals that produce hydrogen or helium to fill your dirigibles. Or handy underground deposits. Magical phasing creatures which can pass through the sand, bringing stuff with them, as mounts, cargo transport, and entry/exit methods. Probably an underground city again here. Use a magical mineral which repels wind or sand, thus allowing you to part the wind and/or sand around your city. Place it appropriately at the leading edge of your city. Animals with control over wind or sand, should that control be large enough may also be able to be trained for this. 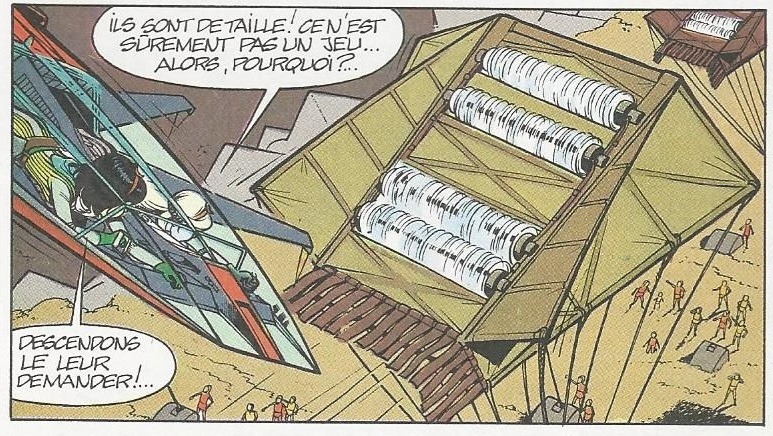 In Yoko Tsuno : the 3 suns of Vinea (french comic), there is a small city near an exhaust pipe of a wind factory. Their architecture look like trapezoidal houses build in the mountain to allow wind to pass by, regulate temperature and harvest wind energy with small turbines. They harvest energy from the wind with big flying kites. 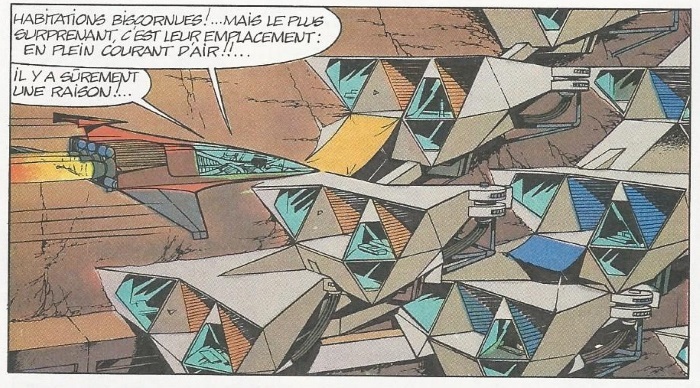 There is no concept of erosion in the comic but since it is an extra-terrestrial lifeform, they might have strong unknown material to manage this. Sand burial is managed by the fact that everything is on higher grounds. This is not exactly the same as the conditions in Brandon Sanderson's The Stormlight Archive series, but the principle is similar enough: every few days a highstorm (a massive hurricane powered by magic that keeps it from immediately petering out when it makes landfall) blows across the continent, always from east to west. Cities are built in laits, which are natural shelters afforded on the leeward side of cliffs and other large rock formations. This provides a great deal of protection from highstorms, and it would likewise provide protection for your wind-land cities. The really tricky thing here isn't the cities, though; it's travel between them. If the wind never lets up, it's very difficult to safely go outside of sheltered areas! Not the answer you're looking for? Browse other questions tagged environment cities deserts or ask your own question. What considerations does a city built on an oceanic platform have to make? What would be the practical considerations for a floating city always at day? What are the design considerations for my underwater settlement? Would a tunnel in sand collapse? How to sustain/create a 4 foot tall city?